It was Justin Trudeau's most Harperesque moment — opting not to go along just to get along with 10 other Pacific Rim nations determined to salvage the Trans-Pacific Partnership in Vietnam. Earlier this week, the prime minister hit the brakes on throwing Canada's full support behind the proposed "TPP 11," a salvage of the larger pact that President Donald Trump killed when he withdrew U.S. support earlier this year. Trudeau's muted enthusiasm for a quick deal triggered the harshest barrage of international criticism he's ever faced. Much of the outrage over Canada's sudden outlier status — a position it frequently occupied under the Stephen Harper Conservatives — emanated from Down Under. An Australian television station cited sources who said, "the Canadians screwed everybody." "Justin Trudeau sabotages Trans-Pacific Partnership," the Sydney Morning Herald newspaper flatly declared in a headline. Late Friday, the talks had made enough progress for Canada to declare a modest victory, but it was a far cry from the "deal in principle" Japan's economy minister was trumpeting the day before. Once the headlines faded, the strategic calculation behind why the prime minister decided to slow things down came into sharp focus: jumping quickly into that trade deal would have weakened Canada's hand in renegotiating NAFTA with an even harder-nosed Trump administration. That view came from some unlikely sources, including some former Harper-era Conservatives who were intimately involved in the original negotiation of the TPP, the Canada-EU free trade deal known as CETA, and many other deals of varying sizes. "Canada's response is not surprising, given all (previous) outcomes were negotiated with the dominant U.S. economy at the table," said Adam Taylor, a former aide to Conservative trade minister Ed Fast and a principal at Export Action Global, an Ottawa-based trade consultancy. "It now makes sense to step back, evaluate Canada's long-term offensive and defensive interests and adjust the TPP to present-day realities." The U.S. economy accounted for more 60 per cent of the combined GDP of the TPP's original 12 countries, which also include Mexico and Japan — the latter of which, along with Australia, has become one of the biggest boosters of a new, post-Trump TPP. Despite its rejection of the Pacific Rim pact, U.S. negotiators have brought significant chunks of TPP text to the NAFTA renegotiations as a template to advance progress. But a massive gap has emerged between the U.S. and its two North American partners. The U.S. wants higher American content in automobiles and wants to do away with Canada's supply management system in agriculture. "From autos and manufacturing to agriculture and culture, Canada has significant skin in the game and should take the time necessary to get it right," Taylor said in an email to The Canadian Press. "Negotiating by calendar, stopwatch or trying to shoehorn announcements into international summits for logistical ease is antithetical to strategic long-term planning and goes against Canadian interests." Michael Geist, the University of Ottawa law professor specializing in e-commerce, made clear in a series of Twitter posts that the TPP could influence Canada's success in the NAFTA talks. "My guess would be the NAFTA talks make concessions on auto and agriculture incredibly difficult as TPP could undermine those negotiations," said Geist. "TPP was not (the) Liberals' trade deal. 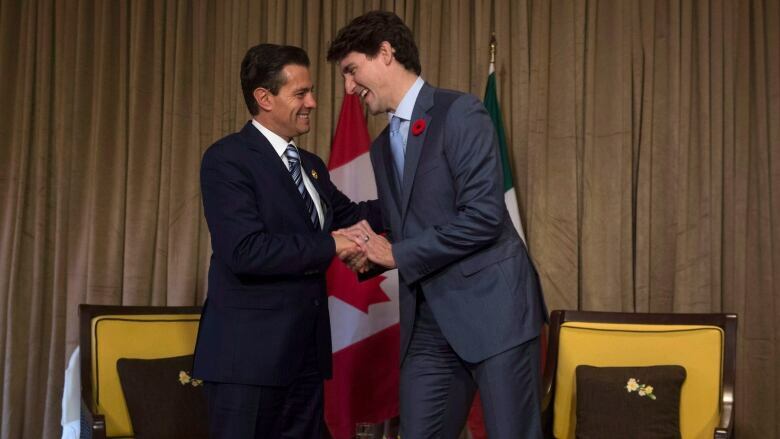 CETA was top priority, then NAFTA." Some say that if Trudeau's tough stance towards the TPP is being influenced by NAFTA and Trump, then that's just not a good thing. "If we are blocking for fear of annoying the U.S., that seems silly to me," said Derek Burney, a former chief of staff and Canadian ambassador to the U.S. under former Progressive Conservative prime minister Brian Mulroney. Burney and Mulroney have both briefed Trudeau's current Liberal cabinet on their NAFTA strategy. Burney called Trump's decision to leave the TPP "a major, geo-strategic blunder" that will only empower China. He also said Canada needs to explore "all promising avenues" to increase trade with countries such as China, India and Vietnam. "I do not see how our stance will help us forge closer ties with other Asians in the group, notably Japan, the principal advocate," said Burney. "Our own interests should, in any event, be the paramount consideration and not tactics in other negotiations." Lawrence Herman, a Toronto-based international trade lawyer, said it was "puzzling" to see Canada's reluctance to pursue the TPP with its 10 remaining partners. "With a serious impasse in the NAFTA negotiations looming, it's clearly in Canada's strategic interests to pursue other options, TPP being the most obvious," he said. "Don't we want to show Trump and company that all of Canada's eggs aren't in the NAFTA basket?"